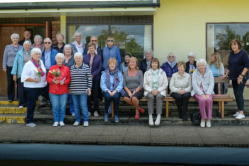 Comberbach WI was formed in 1950 to provide varied activities for women in the village and surrounding area. 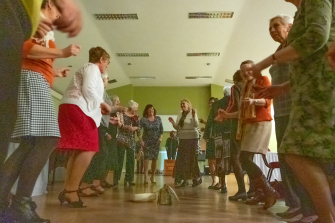 Comberbach WI Celebrated its 69th anniversary in style with a party, buffet and many variations of dancing! An excellent buffet was provided by Louise and her team, Mid Cheshire Catering Co.
A most enjoyable evening, and thanks to everyone who helped to arrange the evening - and turn up! 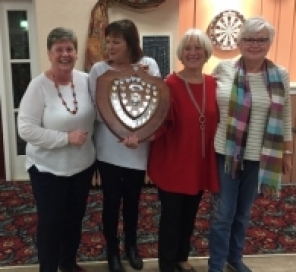 Comberbach WI entered two teams into the Group Darts Competition held at the Winnington Recreation Club. 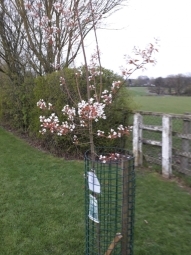 Many local groups attended - Hartford, Whitegate, Witton, Wunsford, Moulton and Little Leigh. After the initial rounds the final rounds were between Comberbach Team B and Winsford. The round was going Winsfords way with their 501 reducing faster than our Team Bs'. With 45 needed to finish, when one player stepped forward and hit the treble 15 - which clinched the match. A noisy celebration ensued. The shield is proudly held by the team above. Well done to the winning team and all other teams who made this evening such fun. 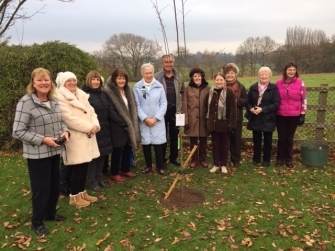 On a cold and damp November day and the day after the Nation celebrated the Centenary of women gaining the vote, some members congregated to plant an Amelanchier tree to celebrate the centenary of the formation of C.F.W.I. 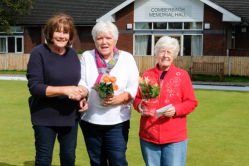 The Federation Chairman, Jean Harding and the Chairman of Comberbach Parish Council John Ryder officiated. The preparation and digging of the hole was done by Tony Rowe, Rosie's husband and his certainly was the hardest job.The ceremoney was followed by a light lunch of soup, sandwiches and delicious deserts all made by committee members. 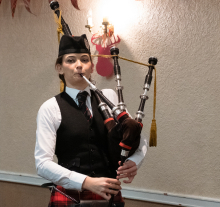 Vale Royal Group Burns Night Supper. On Friday 25th of January twenty members of Comberbach W.I. joined other members of V.R. Group for a fantastic Burns Night Celebration. 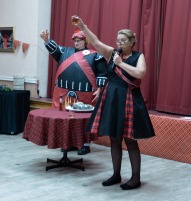 Our members got into the mood and sported various forms of Scottish traditional dress. 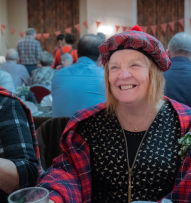 Scottish dancing and indoor Kurling along with a traditional Burns Supper all helped to make this an unforgettable evening. 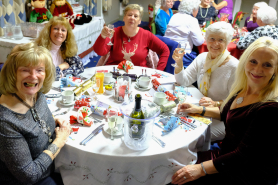 On Friday the 4th Dec 40 of our members enjoyed a very festive Christmas meal at Winnington Recreational Club. 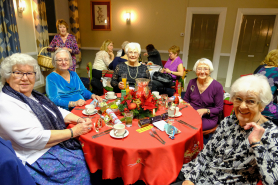 The room was beautifully decorated for the festive season and the food was deliciouse and of a very high standard. 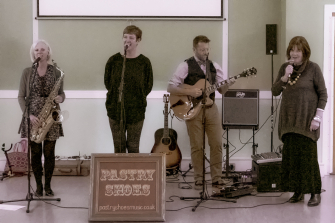 Everyone enjoyed themselves, there was lots of chatter and laughing and everyone commented that they would like to return on another occasion. 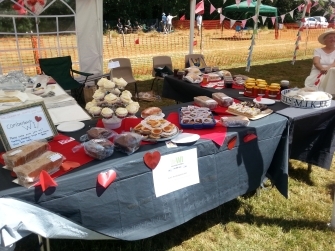 WI's cake stall at the Village Fete. 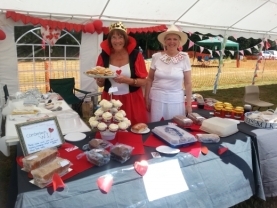 A superb selection of cakes were avalable at the stall and our President, Lindsay Entwistle, The Queen of Hearts and her courtiers won the Best Dressed Stall. 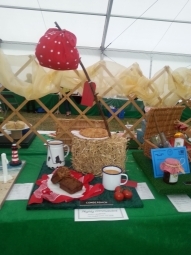 The show had been very enjoyable and quite successful given that not as many of our members had entered items as in the past years.The theme this year was 'Land, Sea,Sky and beautifull displays, interpriting the title, adorned the marquee. 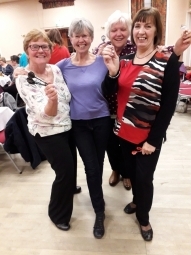 Members of our WI exhibited at the show gaining several awards. The combined entries from our WI in crafts and cookery both gained Highly Commended cards. Janine Hampton gained a 3rd in photography and Miriam Manners Highly Commended . Congratulations to all taking part.